Peter Blair, the mission's preeminent translator and medical man, served forty-one years (from 1856 to 1897) in at least five mission stations. VOLUME IV. NUMBER 47. SALEM, N. C., JANUARY, 1897. The senior minister of the Moskito Coast Mission, Bro. Peter Denton Blair, died on the 1st of January, 1897. Bro. Blair was a native of Jamaica, where he was born in 1835. He possessed many excellent traits of character and was a very gifted man His translations into the native tongue will doubtless prove the most far-reaching of all his many careful labors. At the advanced age of 90 there passed away one who was highly esteemed and greatly beloved throughout the districts around Walderston Mrs. Maria Blair (Grannie Blair). The funeral service was conducted by the Rev. John Kneale of Kingston, now acting Minister of the Mizpah Moravian Church, of which the deceased had been a leading member for over 30 years. In the course of his address, the minister spoke with much feeling of her sterling qualities and of the remarkable influence she had so quietly exerted upon the community. He referred to her years of devoted service as a pioneer missionary in Nicaragua, and to her life long interest in the cause of missions. The funeral was well attended, despite inclement weather, and the service was a most impressive one. The body was laid to rest near by the grave of the late Coi. Geo. Hicks, who had been a close friend all these many years. The grave was covered with a profusion of beautiful flowers — including wreaths of roses, lilies and dahlias from Miss Walder, Inspector and Mrs. Neilson, Mrs. S. W. Hicks, Mrs. Kneale, Mrs. Prendergast, Miss. V. Prendergast, Miss C. Prendergast and Miss Gerty Cuthbert. Mrs. Blair was the widow of the Rev. P. W.[?D] Blair, she was born in 1839 at Richmond Hill, near Mile Gully, and was a member of the Bethany Moravian Church. She was married in 1870 at Carmel Moravian Church, Westmoreland. 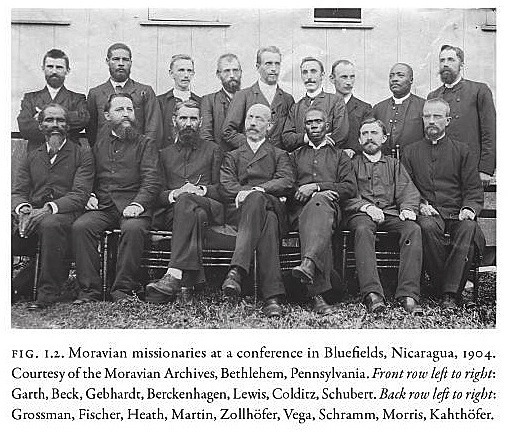 In March of that same year her husband was called by the Moravian Church as a Missionary to the Mosquito Coast, Central America, and she bravely accompanied him and took her part in the pioneer work among the Indians. In 1870 she was stationed at Ruyalaya, from 1877-1882 at Pearl Lagoon, then at Tasbapauni till 1886 when she returned to Jamaica for a short visit. The following year she resumed her duties at Tasbapauni where she remained until the death of her husband 1897. She then came back to her native land and resided at her home "Marlie Bank" near Walderston. In 1903 she lost her sight entirely and for the last years of her life, was confined to bed and bore much suffering with great fortitude encouraging all who came to visit her. She passed away very peacefully on the 17th. September 1929 at 4.30 a.m. leaving two devoted daughters to mourn her loss. A Candidate for Medical Mission Service. In holding services at these out-stations, Br. Walder has the aid of an assistant and of several day-school teachers. The assistant at Mizpah is Br. Joseph Blair, son of Br. Peter Blair of the Moskito Coast Mission. He was trained at Fairfield Normal School, and has been a teacher for some years on the Moskito Coast. Having a desire to study medicine, he returned to Jamaica, where he spent some time in the government hospital acting as dispenser. But finding himself unable to continue his studies, he offered his services to the Jamaica Mission. In an interview I had with him, he expressed his strong desire to become a medical missionary. Medical mission work in Nicaragua began in 1896, when Dr. Joseph Blair, of Pearl Lagoon, and his wife, a trained nurse, served for two years. Frederic Smith worked twenty-six years while serving in at least four Miskito villages. He also made the first exploratory trips to the Wangki River between 1892 and 1895, introducing the mission to the most densely populated Miskito region of Nicaragua. Jacob Lewis served forty-four years and was responsible for establishing the first mission among a Mayangna Indian community at Karawala in 1892. Another Black man, a Pearl Lagoon Creole, Benjamin Garth, served the mission at least forty years and was the first native Mosquitian to be ordained, in 1900. Benjamin Garth was a native son of Pearl Lagoon. He was ordained in 1899, the first Creole and Nicaraguan to become a deacon in the Brethren’s Church. It is not clear when Garth became a missionary, but earlier he had been a rubber trader in Pearl Lagoon . . .